Now this was a fragrance I couldn’t resist purchasing the moment I smelled the wax. A very unique and refreshing pineapple greeted my nose with a hint of something else I’m guessing was the basil. It was hard to tell but it smelled really bright, and I knew right away this was not your average pineapple scent. The vessel was indeed lovely… I wouldn’t call it “vintage” but the ribbed yellow glass had a really modern look that I was definitely attracted to. The scent… pineapple stood out the most over all the other fruits listed in the description. Maybe I could smell a little star fruit but it was hard to tell. I didn’t smell any floral but who knows what elements may come to life once the candle was burning. I lit this candle in a small bathroom to start out where it stayed till the very end. I wanted maximum scent throw and definitely achieved that in a smaller room. The aroma… I keep going back to a very different pineapple. 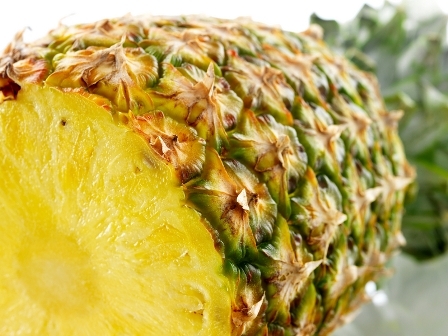 It wasn’t sugary sweet or tart like a typical pineapple we’re all used to. This scent had more of a sharp bite to it which I’m guessing was the basil and green palm and maybe even the hints of floral mentioned in the description. It was all blended so well, it was really hard to tell what from what and because of that, I think this is one of those fragrances you really need to experience yourself to see what I mean. The only constant I can give you is that the aroma was fruity and fresh. Strength – I would rate this candle a 7 out of 10 in a small room. I would even try in anything larger and if you do, go with a bigger candle. This candle had a tough time achieving a full melt pool the entire life of this candle. As a result, a thick layer of wax was left along the glass wall. To help it along, I used my wick dipper to push the leftover wax into the melt pool just about every day. Had I not done that, a lot of wax would have been wasted. Not a big deal but something I like to point out. 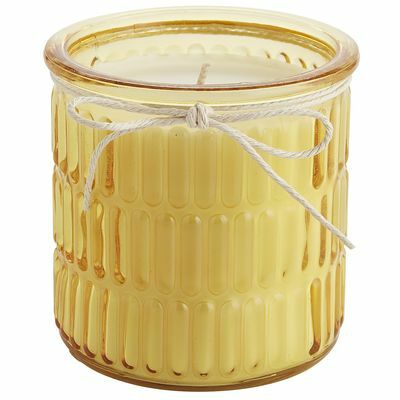 Pineapple Basil from Pier 1 was a really cute candle and smelled very fresh but it’s unique and a scent I recommend you smelling prior to purchasing it. You’re either going to love or hate it. I thought it was different and not bad, I just think I would have preferred more sweet pineapple rather than all the other elements. Just a personal preference. You win some, you lose some. Check it out next time you’re near a Pier 1 store. You may love it. You never know.